Are you looking for Peppa Pig gifts for someone who loves the show? I’ve created a list of Peppa Pig gift ideas at every price point. Hand-curated by me. Peppa Pig revolves around Peppa, a female pig, her family and friends. Each of her friends is a different species of mammal. Peppa’s friends are the same age as she is, and Peppa’s younger brother George’s friends are the same age as him. Episodes tend to feature everyday activities such as attending playgroup, going swimming, visiting their grandparents, cousins, going to the playground or riding their bikes. 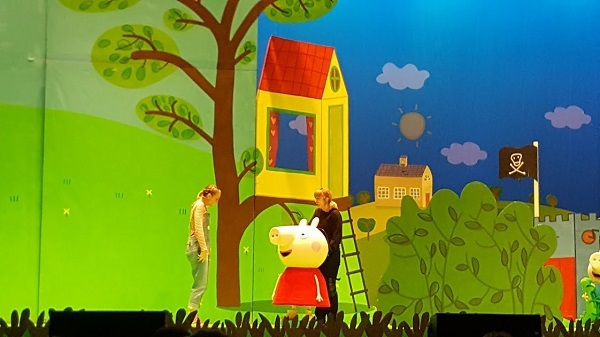 A couple of years ago, I took my daughter, who was six, to see Peppa Pig Live! It was called Peppa Pig’s Big Splash! 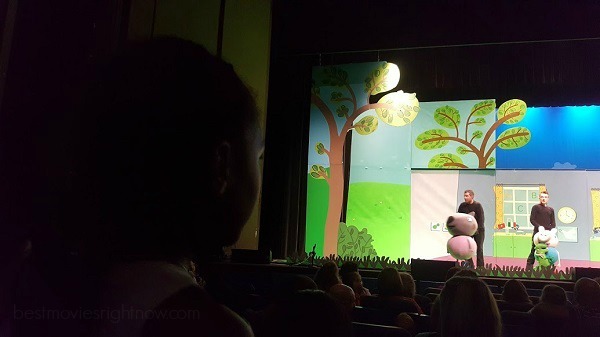 The tour went through the US that Fall, visiting more than 31 theaters nationwide. We enjoyed seeing Peppa, George and all their friends when they came to our town. Here are 10 pig themed gifts you’ll love! 1. Peppa Pig Transfer Patch – This iron on transfer patch can be used on denim, cotton and non-stretch fabrics, clothing, bags, headbands, etc. Add Peppa to create something unique. Great idea for Peppa Pig gifts for boys! 2. Peppa Pig Applique With Sequins – Want to jazz up something and a little Peppa to it? This applique can be ironed on or sewed on. It’s a great size for any project: bags, hair bows, shirts, jackets, etc. 3. Peppa Pig Nesting Dolls – This set of seven nesting dolls is made from high-quality wooden blanks and is hand-painted. These unique pig gifts include Mummy, Daddy, Peppa, George, Suzy Sheep, Rebecca Rabbit, and Mr. Dinosaur (George’s toy dinosaur). 4. Peppa Pig Posters – Choose from three watercolor-style downloadable files: Peppa, Princess Peppa, or Peppa and family. 5. Peppa Pig Shoes – If you have a toddler, these made to order shoes are on my list of favorite pig gifts for her! They feature Peppa Pig and George. You can include the child’s name on the shoe to make this a pair of truly personalized Peppa Pig shoes. This is my favorite personalized Peppa Pig gift! 6. Peppa Pig Family T-shirts – Each member of your family can represent his or her favorite Peppa Pig character with these family t-shirts. Lots of designs and options for everyone to choose from. 7. Peppa Pig Notebook – Keep all of your ideas and secrets in this cute notebook featuring a cover photo of Peppa Pig as a princess complete with a magic wand. 8. Peppa Pig Duvet Cover – Have a sleepover with Peppa every night with this fun duvet cover featuring Peppa and family. 9. Peppa Pig Pillow – Peppa makes a great addition to a child’s bedroom or playroom. 10. Peppa Pig Tote Bag – This tote bag ensures you always have your stuffed animals and toys corraled. Don’t forget that these make perfect Peppa Pig birthday gifts and Peppa Pig Christmas gifts! 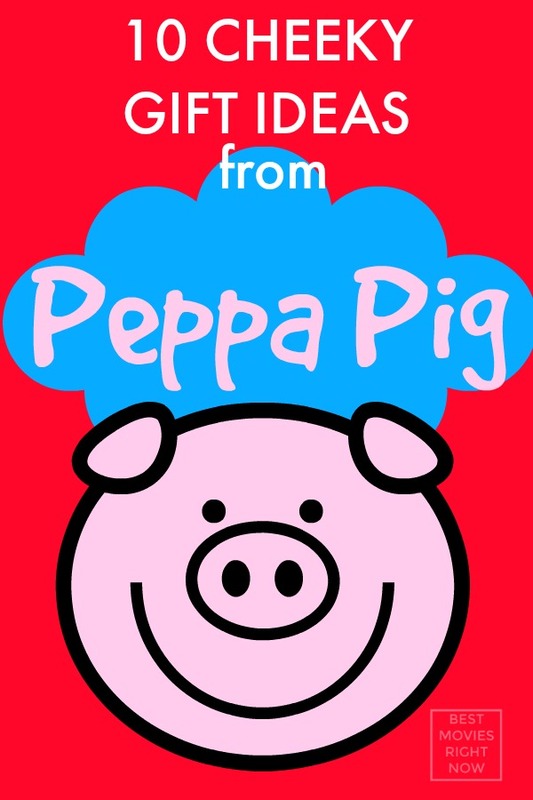 WHAT DID YOU THINK OF THIS PEPPA PIG GIFT IDEAS LIST?